Community litter receptacles help create clean public areas and encourages participation in waste management programs. 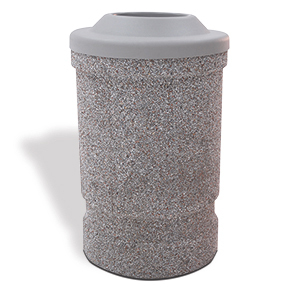 These robust 53 gallon receptacles are constructed ready, with reinforced concrete to provide lasting service. The made strong polyethylene pitch-in lid offers hands-free disposal while it conceals contents and minimizes odors—and will not fade, dent, chip, rust or corrode. Security cable comes standard, liner is optional and sold separately. ASTM compliant concrete is often installed in modern landscapes for its natural look and low maintenance durability. Meet design expectations with the available variety of color and finish options.